This was on my wish list for a long time. 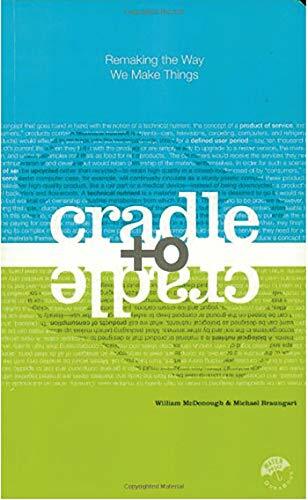 Then I attended a speech by Michael Braungart at a conference on June 6 2007 and I was captivated, mesmerised, by his message. It is that simple. We just have to redesign our industry along nature's principles, where everything is part of and endless cycle, where everything is ultimately food for something new and where there is no waste. It has been done already, and by big corporations. I will finish this book very soon. It was indeed an inspiring read. It is clear that we cannot continue living the way western civilization propagates. But there has been quite a lack of vision on to how we should be living. And going to zero is not much of a vision, if you ask me. That is the strong point of this book - it creates a vision right before our very eyes. I will do my very best to help create this world, both privately and professionally. The book itself is a clear example: it is not made of paper, there is not one living tree less on the planet because of it. The pages are made of polymer, which can be reused endlessly without loss of quality and the ink can be cleaned with non-toxic solvents. I loaned this book to a possible partner in my work. I hope it inspires him equally!